Ya know, when I first started to knit I experimented with different stitch patterns and made lots and lots of these kinds of squares. I swatched also, although at that time I had no idea why I should keep them (I know now, I’ve evolved!). And then the brainstorm… why not stitch all of these wonders together into the awesome afghan I pictured in my head. 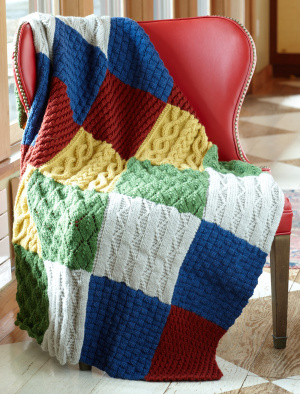 Well, that never happened and I’ve since gotten rid of those first pieces, but if you do have the initiative to knit a bunch of squares together to do a sample afghan, this one would be cool to do. From Lion Brand, the FREE pattern is HERE.